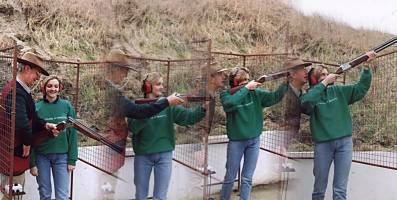 Safety aspects of gun handling and ammunition are carefully explained and practised. We hold an Avon & Somerset Constabulary Exemption Certificate, allowing you to shoot without a shotgun certificate under our supervision. Hire of shotguns and purchase of ammunition is available for beginners, for use on the ground, while under our supervision. Our coaches are trained to ensure your safety. The club holds safety training days and most of our staff hold the Clay Pigeon Shooting Association Club Safety Award. Trained First Aid personnel are in attendance to ensure your well being in case of illness or accident. Third Party Insurance cover is provided with the NFU Mutual Insurance Company, covering the ground and it's members and guests. Our certificate is displayed on the clubhouse Notice Board. Statutory cover is provided by NFU Mutual. The certificate on clubhouse Notice Board. The ground is also affiliated and registered with the sport's Governing Body the CPSA (Clay Pigeon Shooting Association).